But rapidly rising volumes have put the pair of legacy shippers in a bind. E-commerce sales have risen over 50% and are projected to continue their ascent into the next decade. High volumes are already straining shippers’ networks — UPS struggled to bring consumers their parcels on time due to higher-than-anticipated package volume, which upset some big-name retail partners, including Macy’s, Walmart, and Amazon. As online sales surge further, package volumes will outstrip legacy shippers’ capacities, creating space for new entrants. Amazon is uniquely well-positioned to dethrone UPS and FedEx’s duopoly. It’s built up a strong logistics infrastructure, counting hundreds of warehouses and thousands of delivery trucks. Further, as the leading online retailer in the US, it has a wealth of data on consumers that it can use to craft a personalized delivery experience that’s superior to UPS and FedEx’s offerings. Amazon must act soon, however, as UPS and FedEx are hard at work fortifying their own networks to handle the expected surge in parcel volume. The longer the Seattle-based e-tailer delays the launch of a delivery service, the more it runs the risk that these legacy players will be able to defend their territory. In The Amazon Fulfillment Report, Business Insider Intelligence explains how the age of e-commerce is opening up cracks in UPS and FedEx’s duopoly. We then outline how Amazon’s logistics ambitions began as an effort to more quickly get parcels out the door and fulfill its famous 2-day shipping process and how it’ll be a key building block for the company if it builds out a last-mile service. Lastly, we offer concrete steps that the firm must take to maximize the dent it makes in UPS and FedEx’s duopoly. The companies mentioned in this report are: Alibaba, Amazon, FedEx, and UPS. While UPS and FedEx have dominated the US last-mile delivery market for the last few decades, the surge in e-commerce is creating more volume than shipping companies can handle. Amazon is uniquely well-positioned to put a dent in UPS and FedEx’s duopoly due to its strategic position as the leading online retailer in the US. Amazon can carry its trust amongst the public, a wealth of consumer data, and its ability to craft a more personalized delivery experience to the last-mile delivery space to ultimately dethrone UPS and FedEx. 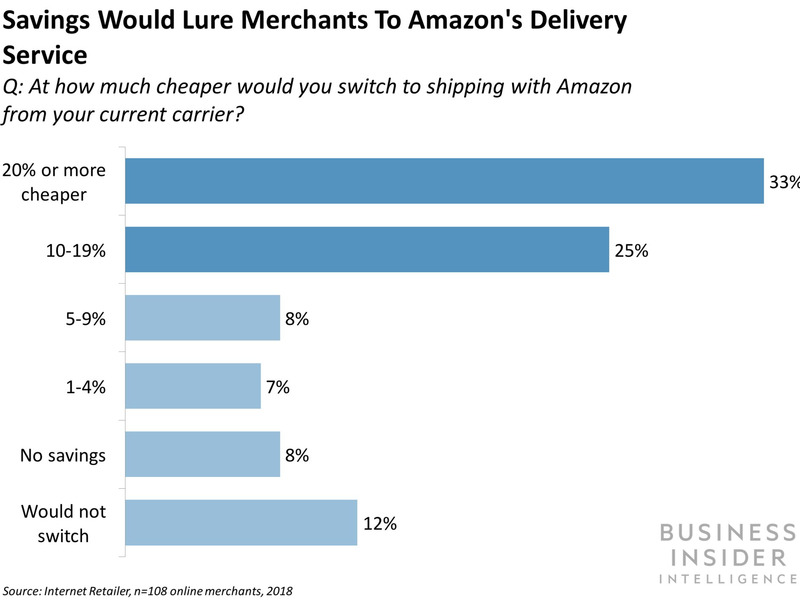 The top priority for Amazon in taking on UPS and FedEx needs to be offering substantially lower shipping rates — one-third of US retailers say they’ll switch to an Amazon shipping service if it’s at least 20% cheaper than UPS and FedEx. Outlines Amazon’s current shipping and logistics footprint and strengths that it would bring to the last-mile delivery space in the US. Lays out concrete steps that Amazon must take if it wants to launch a standalone last-mile delivery service, including how it can offer a more memorable, higher-quality delivery experience than UPS and FedEx. Illustrates how Amazon can minimize operating costs for a delivery service to ultimately undercut UPS and FedEx’s shipping rates in the last-mile space. The choice is yours. But however you decide to acquire this report, you’ve given yourself a powerful advantage in your understanding of Amazon fulfillment.